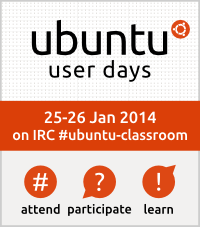 Ubuntu User Days coming up! Next weekend, from Saturday the 25th at 14:30 UTC until Sunday the 26th at 01:00 UTC the Classroom team will be hosting the Ubuntu User Days! The best thing is, everyone can come! If you want to participate, you just need to join #ubuntu-classroom and #ubuntu-classroom-chat on irc.freenode.net in your IRC client, or just click here for browser-based Webchat.